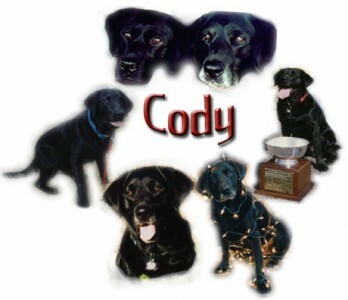 “Cody came into my life as an Empty Nest Syndrome Christmas present from my husband. He was not structurally put together well, had seizures and mild hip dyplasia. But this wonderful lab had more heart and could learn to do almost anything I would ask. He had that typical sweet lab temperament that I love! We had such an adventure together. He went to many USDAA Nationals, the first AKC Nationals and also even did two TV commercials and also was in three national calendars (including being on the cover of one)!